Ava is inquisitive and intelligent, with a preference for books over toys, or toys which require a little dexterity. I often find her creating her own games or playing with Noah's toys because bog standard baby toys no longer cut it for her. With this in mind, I was really excited when I was asked to review the Hape Discovery Box as I thought it looked perfect for Ava. 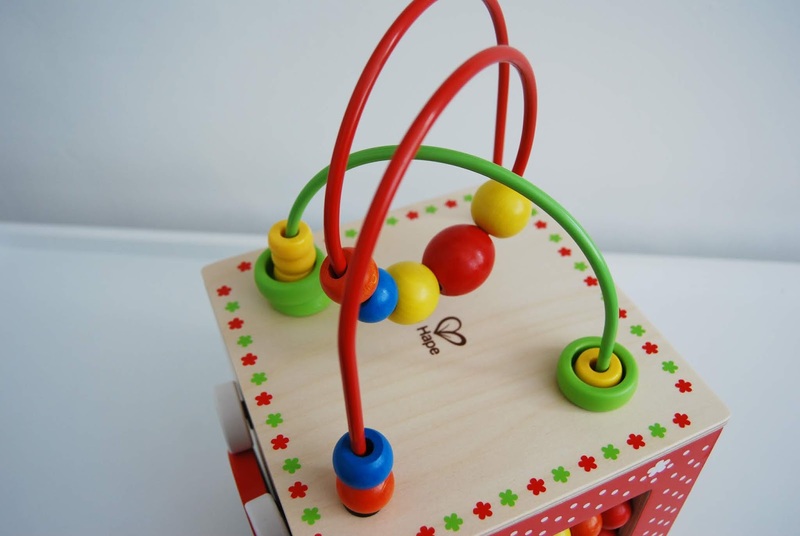 The Discovery Box is a five sided solid wood box with a different activity on each side. 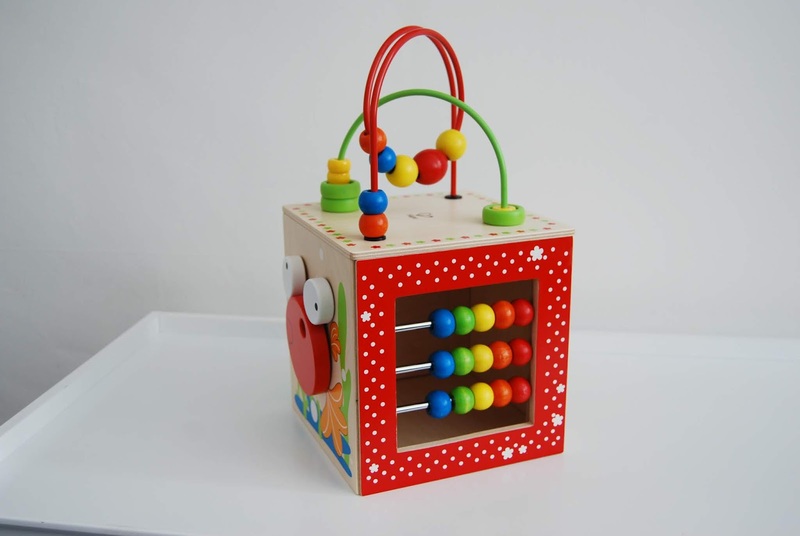 There's a wire bead maze, large mirror, colour wheel, a spinning fish and a classic abacus. It's designed to help build fine motor skills and hand-eye coordination while helping develop counting skills, colour and shape recognition too. I was so impressed when it arrived and I couldn't wait to see what Ava would make of it. As you can see the Discovery Box has been a huge hit with Ava, she beams from ear to eat when she is playing with it! She spends a lot of time sitting beside it, to explore all the different sides and has a favourite side already, the wire bead maze! It didn't take her long to figure out each side and you can see the sense of accomplishment in her face when she's completed an activity, it's so very sweet! I'm looking forward to using the Discovery Box over the next couple of years because I know it's a toy that will grow with Ava. It will be an invaluable learning aid when it comes to teaching her to count and when it comes to learning shapes and colours. Once she's finished with it I'll donate it to their nursery so all the children there can enjoy it too. The Hape Discovery Box is suitable for children of 2 years and onwards, it retails at £32.49 and is available to buy online at Amazon. Now here's your chance to win 1 of 2 prizes from Hape; the Hape Rolling Roadster or the Hape Sky Flyer! To enter, simply use the Gleam form below and don't forget to enter my other blog competitions! 1. There will be 2 winner who will each win one of the prizes mentioned above. 2. Winners details sent to HAPE to arrange the prize. These toys look amazing and very educational for young children. My son would love Hape Sky Flyer. We regularly fly to Ireland to see his grandparents so he has a lot of interest in planes! Ava looks like she was enjoying those gorgeous boxes. Bea and I would love the Hape Skyflyer please because they are bright and easy to hold for tiny hands. I think my daughters would love the sky flyer. Although both look great. I'd like to win the Hape Sky Flyer. The Hape Plane please, my daughter would love it! The Hape Sky Flyer would be great! The Hape Sky Flyer please! The Sky flyer as Iris is currently a bit afraid of the noise planes make so it would be a nice way of getting her familiar with them and making them exciting. Either would be fab. I don't have any children but would love to win this prize to donate to charity, to go to Romania. I think the The Hape Rolling Roadster would be my choice. Hape Sky Flyer I think, they can chose if they want it to fly or go on the ground. This looks like a super little prize/. What a super prize this is for a little one, I think my grandson is just a bit to little, but mayybe buy one christmas, or get one and put it away. The Hape Rolling Roadster would be fab! I would like to win the Hape Sky Flyer for my nephew. We would love either but the Hape Sky Flyer wins by a whisker. The Hape Sky Flyer (plane) please! I would choose the Hape Sky Flyer. Great toys. I would love to win The Hape Rolling Roadster! It looks absolutely fab! I would love to win the Hape Rolling Roadster! The Hape Sky Flyer (plane) would be lovely, please.